The Connecticut Food Bank is proud to announce the return of our Greater New Haven Walk Against Hunger. Join us at Lighthouse Point Park to rally in support of neighbors in need and get on the move toward a hunger free Connecticut. 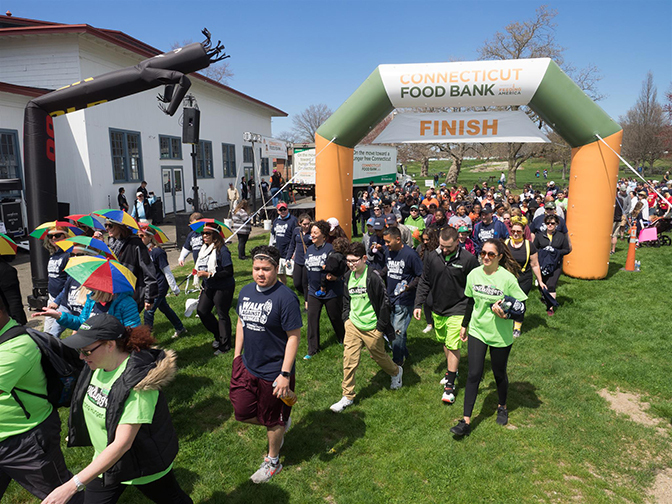 As a participant in the Walk Against Hunger, you help the Connecticut Food Bank provide nutritious food to people in need. We value your commitment to our mission and hope you will walk with us. Many of our neighbors in cities and towns across the state battle hunger every day. This spring, the Walk Against Hunger will bring attention to their challenges and raise funds to put more food on their plates. More than 650 local food assistance programs rely on the Connecticut Food Bank as a resource for nutritious food to serve their community. Through this network, the Connecticut Food Bank distributes enough food across our state to make 50,000 meals a day. Support the Walk Against Hunger and the work of the Connecticut Food Bank by stepping out on April 29. It’s free, easy and secure to register and join or build a team online. It’s as simple as clicking one of the buttons at the top of this page! You can add a photo or video to your message and email your friends and family to sponsor your effort. No need to collect checks or cash – donations are made directly to you through your Walk page! If you have any questions regarding the Walk Against Hunger, please contact mfreedenfeld@ctfoodbank.org.